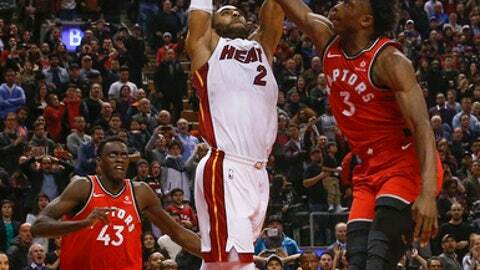 TORONTO (AP) Wayne Ellington leads Miami in 3-pointers, which made Tuesday’s game-winning basket a bit of a surprise. Ellington converted a go-ahead driving layup with less than a second remaining, and the Heat stopped Toronto’s 12-game home winning streak with a 90-89 victory over the Raptors. Ellington said he considered shooting after catching the inbounds pass from Goran Dragic, but decided to drive along the baseline past Toronto’s Pascal Siakam before laying the ball in off the glass. Like his coach, Dragic also was surprised when Ellington didn’t launch a 3. ”I thought he was going to shoot it but he made a great read,” Dragic said. The Raptors were without point guard Kyle Lowry after the three-time All-Star bruised his tailbone during Monday’s overtime win at Brooklyn. ”We let them get easy points,” DeRozan said. It was Toronto’s first home loss since Nov. 5 against Washington, a game in which Lowry was ejected early in the second quarter. The Raptors are 14-2 at home. Ibaka and Miami’s James Johnson were ejected after trading punches at 7:50 of the third quarter. The skirmish began when the two started shoving one another while waiting for the ball to be inbounded under the Miami basket. Officials reviewed the incident before giving both players technical fouls and ejections. Miami guard Tyler Johnson, who had started the previous 10 games, was unavailable after he strained his left shoulder at shootaround. His status for Wednesday’s game at Indiana was not known. Heat: Miami outrebounded Toronto 64-37. … Improved to 14-3 when holding opponents below 100 points. … Ellington had three of Miami’s four 3-pointers. Raptors: The Raptors also won 12 straight at home from Jan. 18 to Mar 4, 2016. … The loss ended Toronto’s streak of 12 straight wins over Eastern Conference opponents. It was Miami’s second straight one-point win. The Heat beat Utah 103-102 on Sunday thanks to Josh Richardson’s layup with five seconds left. Miami’s previous win was an overtime victory over the Knicks.